Are your technical presentations dull, overly complex and off target? Organizations today use presentations both to deliver their messages to customers, conferences and trade shows, and to carry out internal development of both product and strategy. Although technical professionals bring technical mastery to these challenges, their presentation skills frequently limit their performance. This hyperbook is packed with tips that show how to create terrific technical presentations. How To Orderpeople in your organization make technical presentations, chances are good that they're doing it without training. Some are naturally good at it. 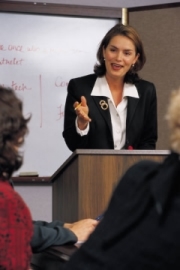 A few have had presentation skills training, but even fewer have had training for technical presentations. Terrific Technical Presentations fills that gap. Ideally, we'd like technical professionals to present their own technical content. Only they have the depth of understanding needed to project true credibility. But too often, the presentations of technical professionals are ineffective. They fail to focus on the customer perspective. They run over time while failing to make the most important points. Through it all, we often see too much emphasis on the beauty or elegance of the product, and too little emphasis on how it can help the customer. This program gives technical professionals enough of the savvy of the professional presenter to make their technical presentations terrific. It shows your most credible employees how to deliver your message effectively — to peers, to management, to customers, and to industry. Throughout, you'll find links to resources on the Web for further information. We're continuously improving the content of Terrific Technical Presentations . We distribute periodic updates, which are included in your fee for one year. Here are a few of the tips from "Create Powerful PowerPoint." You don't need your corporate logo or your contact information on every slide. First and last only, if that. Ditch the outline. Replace it with bullet items that intrigue and motivate. Use a dark background, with light-colored type. A bright screen can make it hard to see the presenter. A dark background in deep blue sets off the presenter. One bullet item, one line. Multi-line bullet items contribute to a cluttered feeling. Break such items into two, or reword. Price: USD 49.95 per copy. Order Terrific Technical Presentations by credit card, for USD 49.95 each, using ClickBank.com.